Once thought to be a single vitamin called Vitamin B, several chemically distinct nutrients make up a Vitamin B-Complex including Thiamine (Vitamin B-1), Riboflavin (Vitamin B-2), Niacin or Niacinamide (Vitamin B-3), Pantothenic Acid (Vitamin B-5), Pyridoxine (Vitamin B-6), Biotin (Vitamin B-7), Folic Acid (Vitamin B-9) and Cobalamin (Vitamin B-12). The B-Complex vitamins are water-soluble nutrients that are dispersed throughout the body and play important roles in cell metabolism and essential for a number of health benefits including the rate of metabolism, cell growth and development including the production of red blood cells, healthy skin and muscle tone, the proper function of the nervous system and a strong immune system. 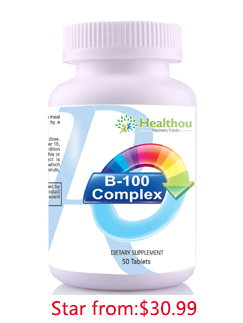 Although not true B vitamins, B-100 Complex SR also provides 100 milligrams per tablet each of Choline, Inositol and PABA (para-aminobenzoic acid) which play important roles in cognition, liver function, fetal brain development and are thought to help promote healthy skin and hair. Because the B vitamins are water-soluble, any excessive intake is excreted in the urine as opposed to being stored by the body. As a result, they must be replenished in the body on a regular basis or a risk of Vitamin B deficiency develops. B-100 Complex SR provides a complete high potency regimen of all of the individual B vitamins in a Sustained Release tablet that allows the body to have a longer period of time during which it can absorb these critical nutrients. SUGGESTED USE: One tablet daily with a meal as a dietary supplement, or as directed by a health care professional. CAUTION: Do not exceed recommended dose.Pregnant or nursing mothers, children under 18,and individuals with a known medical condition should consult a physician before using this or any dietary supplement. This product is manufactured and packaged in a facility which may also process milk, soy, wheat, egg, peanuts,tree nuts, fish and crustacean shellfish.